Pike County Sheriff Charles Reader discusses developments on Tuesday into the slayings of eight members of one family in rural Ohio two years ago. 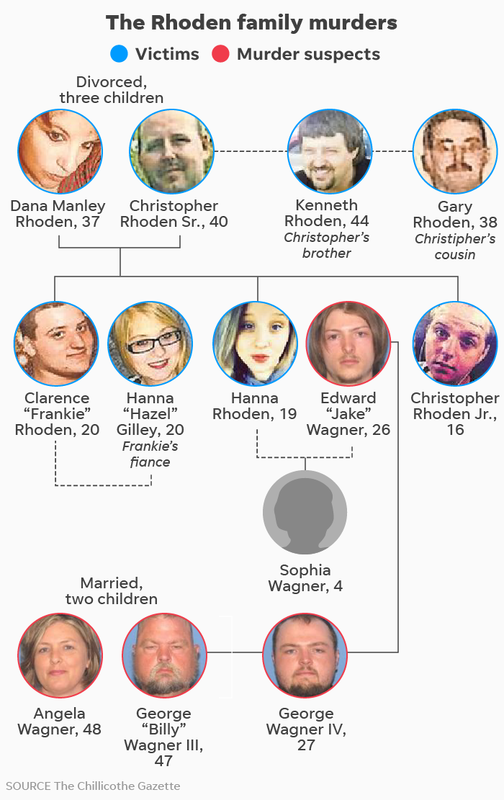 In April 2016, Ohio police found eight slain bodies in trailers across Pike County, seven belonging the same Rhoden family and another the fiancée of one of the Rhodens killed. After two and a half years, arrests came Tuesday tied to their brutal deaths: Members of another local family, the Wagners, who had business and personal ties with the Rhodens, now face capital murder charges. An “obsession” over custody of the 4-year-old daughter of Edward “Jake” Wagner and victim Hanna Rhoden motivated the violence, according to Ohio Attorney General Mike DeWine. Authorities said the killings were methodical. “They did this quickly, coldly, calmly and very carefully, but not carefully enough,” Pike County Sheriff Charles Reader said. Angela Wagner, 48; her husband, George “Billy” Wagner III, 47; and their two sons, George Wagner IV, 27, and Edward “Jake” Wagner, 26, each have been indicted on eight counts of aggravated murder. 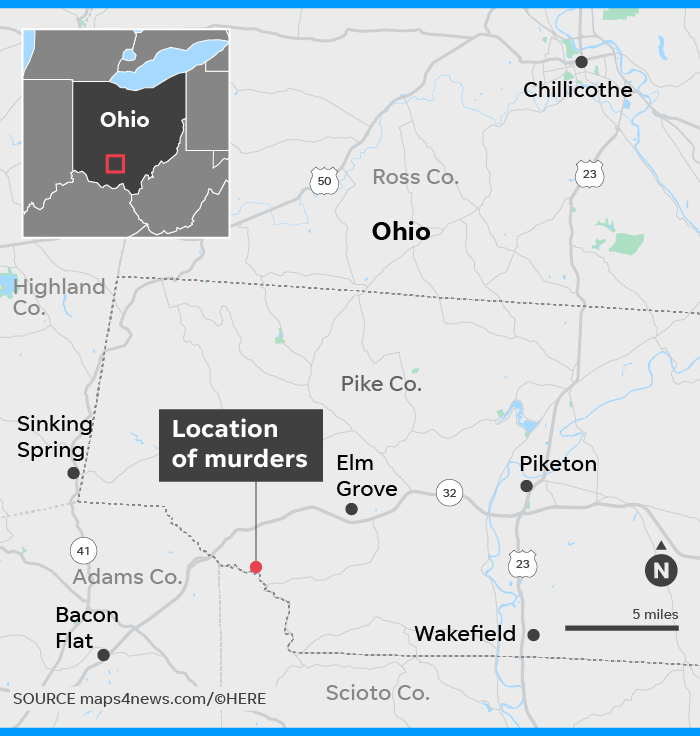 Eight bodies are discovered in four locations on Union Hill and Union roads in Pike County, Ohio. A distraught woman describes the scene in the harrowing 911 call: There’s “blood all over the house.” It’s the voice of Bobby Jo Manley, a relative of those slain. Ohio Attorney General Mike DeWine announces that marijuana grow operations were found at three of the four scenes. He also announces five search warrants were executed, but authorities do not say where. The Hamilton County Coroner’s Office releases preliminary autopsy results of the victims. One was shot nine times. Another was shot five times. The bodies are released to the families. Funeral services for six of the Rhoden family members take place. The burial of five are at Scioto Burial Park in McDermott, Ohio. During the funerals, investigators tow at least four vehicles from the Union Hill Road crime scenes. The Pike County homes where members of the Rhoden family were shot and killed are moved from the victims’ properties by the Ohio Attorney General’s office in order to secure the crime scenes. Leonard Manley, father of Dana Manley Rhoden, says vehicles are being towed from crime scenes. Authorities begin hauling four mobile homes from Union Hill and Union road properties to the Relevant Compounding property in Waverly, Ohio, that serves as the investigation’s command center. A year passes with no arrests and no known motives. The family marks the day with a memorial service at Union Hill Church. Dozens of state and local law enforcement agents search the grounds of a 71-acre Peebles, Ohio, farm. The farm, which sold in mid-March, was once owned by Edward “Jake” Wagner, the longtime boyfriend of Hanna Rhoden, 19. A second search of the Wagner family property takes place the same day. The Wagners move to Kenai, Alaska. “Really the point to moving up here was to basically get into a better environment so they wouldn’t talk about us. Sophia is getting older, so she wouldn’t hear it,” Jake Wagner said. “And then it followed us here.” Sophia is the then 3-year-old daughter of Jake Wagner and victim Hanna Rhoden. While the two solidified a custody agreement in 2016, some family members say the battle over the child was contentious, according to Cincinnati Enquirer reports. On the second anniversary of the murders, Pike County Prosecutor Rob Junk says investigators remain focused on the Wagner family. Two agents from the state’s Bureau of Criminal Investigation and a member of the Pike County Sheriff’s Office stay assigned on the case full-time and work out of an office in the county, Junk says. Investigators say they’ve gathered the last piece of physical evidence. A week later, they say they’ve completed examining the evidence, DeWine says. Four members of the Wagner family are all arrested in different locations and taken into custody. They are charged with aggravated murder with death penalty specifications. Two other family members — Rita Newcomb, 65, of South Webster and Fredericka Wagner, 76 of Lucasville — are arrested and accused of covering up the murders. “We have no evidence anyone else was involved,” DeWine says. Next articleWhere does the future of the American left lie? Is Dez Bryant a Good Fit for the Cleveland Browns?